I was perusing my Twitter PLN as The Frisch Africa Encounter ended, and so I was reminded of an important step in the PBL process: reflection. 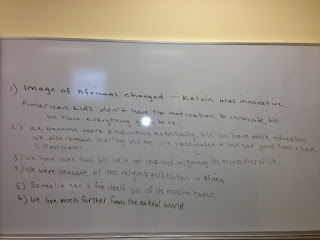 The sophomore grade and I had been doing so much hands-on and non-traditional learning throughout the Africa project that I decided to survey my class of sophomores the old-fasioned way: by having a class discussion and -- gasp! -- writing their reactions on the whiteboard. 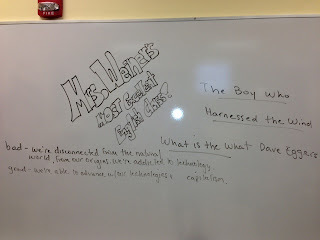 Ken Robinson, forgive me. 1) Image of Africans changed -- Kelvin [a boy from Sierra Leone who repurposed tech garbage into technology he needed and then spent three weeks at MIT under the sponsorship of an MIT student] was innovative. American kids don't have to be innovative, because we have everything given to us. 2) We [American teenagers] become more productive eventually, because we have education. We also remain healthy because we are vaccinated and can eat good food and have clean water. 3) We have more time, because we're not consumed with gaining the necessities of life [e.g., food, water]. 4) We were unaware of the religious persecution in Africa. 5) Somalia can't fix itself because of its religious leaders. 6) We live much farther from the natural world [than do Africans]. Bad: We're disconnected from the natural world, from our origins. We're addicted to technology. Good: We're able to advance with our technologies and capitalism. The students also assessed the way they learned throughout The Frisch Africa Encounter. They loved the type of whole-body learning they engaged in. I teach one section out of seven in the sophomore grade, and my students are Honors students, but a history teacher surveyed her non-Honors classes as well, and the student responses I saw also revealed how much the kids loved the type of engaged and active learning they were doing. They also loved contributing to the project using the skills and passions they had: art, music, writing, technology, fundraising, etc. In short, students understood they were learning in a new way, and they liked and appreciated learning by doing rather than learning by lecture. The class and I have returned to our discussion of The Poisonwood Bible, which we had not been able to finish before the night of the Africa event, on December 18. I'm happy discussion of the book was interrupted (I gave up a lot of class time to the whole-body learning the Africa project demanded). Now that the students have absorbed the lessons of the overall unit, they can analyze the book with a more discerning eye. Example: At the end of the book, a character who has died and has become one with the African forest narrates and sends the message that the white, Western world has to, in essence, get over itself and understand where Africa is coming from and that its values are different from Western ones. A student asked why we should at all help Africa. Why did we do the project? Shouldn't we just leave Africa alone already? It was interesting to see the students reprocess the project and arrive at the conclusion -- again! -- that helping means giving Africans the opportunities to live in the same healthy and productive ways that Americans do, but doesn't mean arriving, as Nathan Price in The Poisonwood Bible does, thinking that our American way of life is inherently better than the way the Africans live. We also discussed in a deeper way than we had at the beginning of the unit the Western world's exploitation of Africa and its resources and our obligation to make reparations, so to speak. Students continue to be enthusiastic about Africa. One day I walked into my classroom to find "We love Africa" written on the board. Another day, a student announced that the Discovery Channel was showing a documentary about animal life in Africa. He found the trailer online, we watched it and gave ourselves homework to watch the documentary. I couldn't be more pleased about the enthusiasm for learning that has developed. The students want to learn not because they have a test, but because they're excited about this new world that has opened up to them and want to understand all about it. They see that though they learned a lot already, what they've learned is just the tip of the iceberg, and they want to know more! I'll end with one more student response: A boy came up to me after our reflection session and said he was overwhelmed. There is so much to do in Africa. "How can we possibly make any difference? There's so much work to be done," he said. I recited a saying from Ethics of our Fathers, a famous compilation of Jewish wisdom: "It is not your responsibility to finish the work, but neither are you free to exempt yourself from doing it." We then discussed how the sophomore grade had already begun the work of helping Africa by engaging in the fundraiser for Innovation: Africa. In sum, then, as much as I love opening my students' eyes to new ideas and new ways of learning, I continue to be touched, awed and humbled by the responses they have when learning about the world they inhabit.